Remember the golden age of HyperCard, when we dreamed of software as something users would create themselves, interactively? 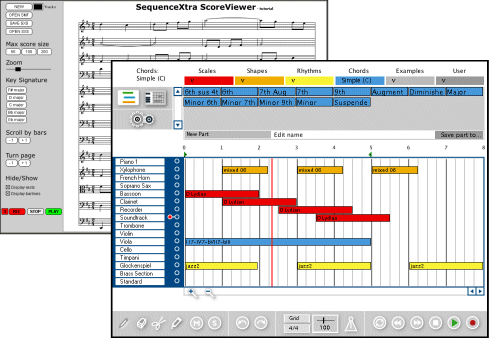 The folks at Sibelius, the notation software company, have come up with an Xtra for Macromedia Director MX/2004 that lets you add a full-featured custom sequencer / score editor to your Director apps. You can record from MIDI instruments, save and open standard MIDI files, edit, quantize, and even display notation. The SequenceXtra runs in Director and costs US$249. The licensing is fairly sensible if you want to distribute your app: free for up to 1,000 distributions online, with $0.50 – $1.00 licenses for sold apps or $300-1000 for free downloaded apps. What you can do with it is what’s really impressive. Sony’s BlockJam physical interface (one of many music-as-building-blocks prototypes), Sibelius’ own Compass learning software, and the fun online Drumsteps game from BBC were all built with the software. Any Director-heads out there care to try this out? Let me know.